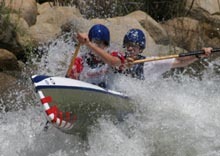 USAWildwater.com your source for the best in downriver action! USAWildwater News: Information is power. This news service is free! Sign up now for free email updates from our news desk. The Cable section of the Kern River is probably the most challenging part of the river that we'll race on here in Kernville CA. This section offers technical rock gardens, big water moves and long challenging flats. 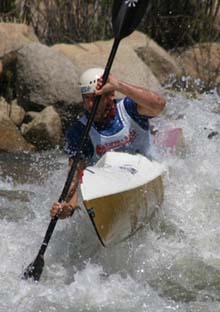 With dropping water levels, this section had been getting more and more technical and had already taken its toll in training with both the American and international teams. USA C1 Team member John Pinyerd was out with a sub-luxed shoulder injury and just about everyone was struggling with boat damage to both bow and stern. It was entertaining to see world-class paddlers training in Wavehoppers and Fastwaves to avoid damage to their race boats. World Cup #1 was a classic or long race of just under three miles and all the action was at a rapid called "The Wall", a sweeping left turn through a violent maelstrom of waves and haystacks with a line less than three feet wide. The biggest problem was catching an eddy and spinning out and hitting rocks hard. The Wall took its toll. A large percentage of the USA Team got eddied out in the Wall, along with many top International competitors bringing new faces into the top ten in all classes. The worst case was USA K1 paddler Chris Hipgrave who spun out so fast he flipped and swam in the heart of the rapid, dashing hopes for a solid performance. World Cup #2 and the Wall continued to take its toll on the competitors. Cup #2 was a sprint race starting just above the now infamous Wall and ending immediately below it. The sprint was about 60 seconds long. Everyone struggled with the complexity of the rapid, particularly when going all-out with lactic acid building up fast. The USA Team fared better this day with fewer mistakes and consistent runs for the most part. However, the Wall took its toll with the International stars. French C1 powerhouse Stephane Santamaria flipped in his sprint sending him down the finish list, but the biggest catastrophe was when multiple World Cup K1 Champion Robert Pontarollo (ITA) spun out and struggled to get things back around, sending him plummeting down the finish list, dashing hopes of another World Cup victory. With the first two World Cups behind use, and, thankfully, the Wall behind us as well, we move to the next two Cups at the same venue as the USA Team Trials. As Team USA knows this section very well, we hope for some outstanding results. View the overall results here. The Bailey Brothers launch at "the wall". Chris Hipgrave builds speed for an ill-fated run of "the wall". 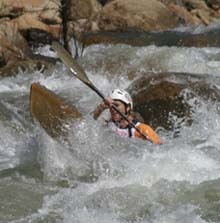 Eric Giddens bounces through the epic rapid. 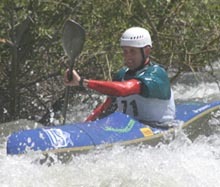 Chris Hipgrave is Tresurer of the U.S. Wildwater Committee and a K-1 Wildwater racer living near Bryson City, NC. Reach him at cxh@compuserve.com.